This is how you can show an automatically updating, published post or page count number anywhere on your WordPress blog or website. 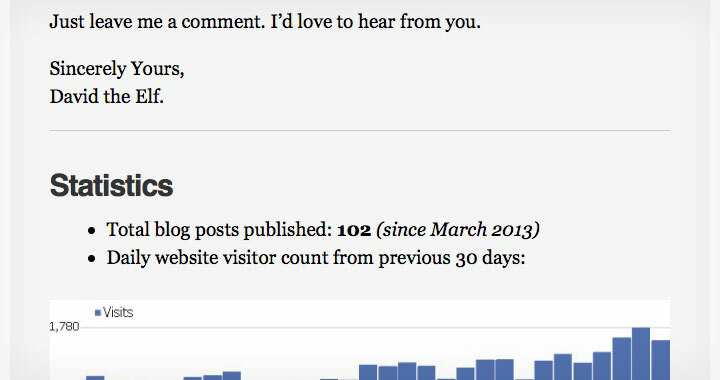 As shown below — I’m using a post sticked to my homepage with statistics about the site. Basically all that’s required is to place a snippet of code in PHP to the desired location on your website. To which there are a few possibilities — of which Insert PHP plugin by Will Bontrager Software, LLC, will probably be the easiest option to place the code anywhere inside a post or page. Alternatively, let’s say if you want to display the post count in the footer of every page — you could directly edit a child theme’s footer.php file and place the code there. This shortcode represents the php opening “<?php” and closing “?>” tags. This is the code to show number of published posts and put it in a sentence. WYSIWYG html editors, such as ‘TinyMCE Advanced‘ will convert the greater than “>” sign (also known as ‘close angled bracket’) into it’s “HTML Name” which is ‘&gt;‘. This will prevent the code from working, and you will get a blank or partial page. Just make sure the code stays intact by directly using the Text editor. PS. Although Insert PHP hasn’t been updated for more than a year — it’s still working well on the latest versions of WordPress. Currently 4.6.1 — despite someone having marked it as broken on the plugin page. Also there are surely other alternative plugins available if interested, this is just the one I found simple and easy to use. I would appreciate it if you leave your website URL in the comments to show what you’ve done with this code. Thanks!